Length: Isaiah 1 contains 31 verses. Date: No date of composition is given, though the nature of Isaiah 1 has led Smith to conclude this chapter was likely written towards the end of Isaiah's life, ca. 690ish BC. He argues certain verses in this chapter speak of King Manasseh's evil reign, thus placing chapter one at the end of Isaiah's life, and written as an introduction to his life's work. 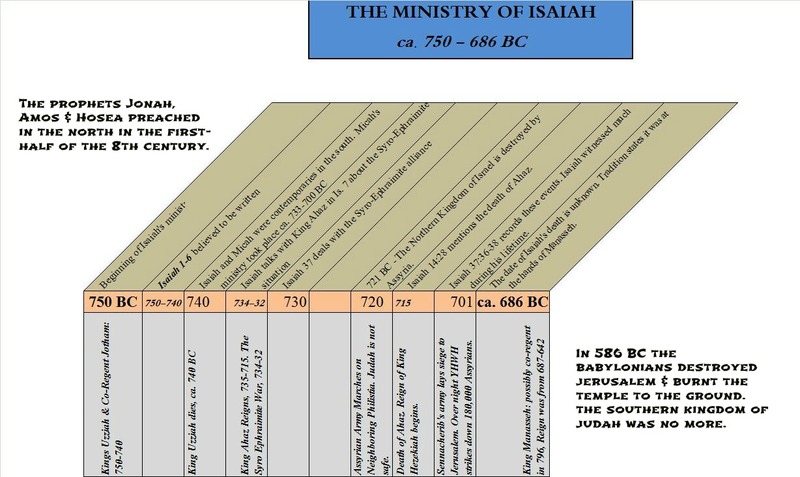 Holman's OT Commentary on Isaiah suggests chapter one was written partly in 740 & 701 BC. Certain passages do seem to indicate a writing of ca. 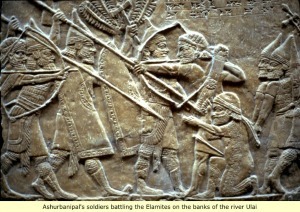 701 BC - when Assyria invaded Judah and surrounded Jerusalem. Structure: Chapter 1 functions as a connector to the end of the book, chs. 65-66. In this way it forms what is called an inclusio, a term used to indicate the beginning and end of a unified and complete narrative. By writing it towards the end of his life, Isaiah could incorporate the whole of his ministry within the themes and concepts of this chapter. Thus, ch. 1 functions as "the introduction to the whole book" (Smith), even though ch. 1 does not summarize the rest of the book. Click on the link to view a particular verse or section. Isaiah 1:1 gives some typical information found when the Bible introduces a prophet. This includes; the nature of his writings (a vision), who the information is intended for (audience - Judah & Jerusalem), the author's name (Isaiah son of Amoz) and the time period (the kings listed) of his ministry/prophecies. Little else is given in ch. 1. The reader is left to deduce Isaiah was of the tribe of Judah and lived in Jerusalem. The chief significance of v. 1 is the fact Isaiah received his instruction through a vision. This gave Divine Authority to his words. 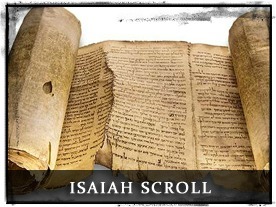 His prophecies were through the eyes of God, thus Isaiah's message was to be taken seriously. The 8th century BC was a volatile time for both Israel & Judah. God used Isaiah to spread a message of future hope in times of present danger and distress. 2 Listen, O heavens, and hear, O earth; For the Lord speaks, "Sons I have reared and brought up. But they have revolted against Me." 3 "An ox knows its owner, and a donkey its master's manger, but Israel does not know, My people do not understand." Smith argues chapter one reads like a Covenant Lawsuit against Israel. God wastes no time in v. 2 levying His charge against Israel. Keep in mind that the use of "Israel" may only encompass those Israelites in the southern Kingdom of Judah. At the time Isaiah 1 was written (see above), the northern ten tribes of Israel had already been exiled by Assyria. In this instance, God very well could have included the northern exiles in this accusation, though their sentence had been pronounced prior to Judah's. If Isaiah wrote ch. 1 at the end of his life he would've known this fact. If in 740 BC the northern kingdom would've still been in existence, as they were not toppled until 721 BC. Seeing how Isaiah was from Judah, and lived in Jerusalem, and has circumstantial ties to the House of David, the contextual evidence suggests this particular charge in v. 2 is levied at those Israelites living in Judah & Jerusalem only. Verse two opens with a call to the heavens and the earth. These are the witnesses that will speak to God's accusation against His people. Israel has violated the covenant set forth with Moses in Deuteronomy. Deuteronomy 30:15 - "See, I have set before you today life and prosperity, and death and adversity..."
Deuteronomy 30:19 - "I call heaven and earth to witness against you today, that I have set before you life and death, the blessing and the curse. So choose life in order that you may live, you and your descendants." The heavens and the earth are the timeless witnesses of mankind's depravity, immorality and disobedience. On the other hand, they are the timeless witnesses of God's repeated mercy, compassion and forgiveness, not to mention His strength. Isaiah makes a stinging comparison to the beasts of burden all Israelites would have been well familiar with. Both the ox and the donkey were staples in daily Israelite life. They were stubborn animals, oftentimes fighting against their masters, yet in the end knowing the hand that feeds them. Israel, however, was dumber than these beasts in that they continued to bite the Hand that feeds them. They do not know their disobedience, and remain stubborn in their hearts. The Bible frequently uses examples of things from daily life that Israelites would've easily related to. "Suddenly he follows her, as an ox goes to the slaughter..."
"A whip is for the horse, a bridle for the donkey, and a rod for the back of fools." THE "HOLY ONE OF ISRAEL" DWELT HERE, ON THE TEMPLE MOUNT, IN THE TIME OF ISAIAH. ISAIAH WAS FROM JUDAH, WHOSE TRIBAL ALLOTMENT IS PICTURED ABOVE. HE PROBABLY LIVED MOST OF HIS LIFE IN JERUSALEM. THE BIBLE DOES NOT SPECIFY WHERE ISAIAH WAS BORN & RAISED, BUT DEPICTS HIM MOST OF THE TIME IN JERUSALEM. 4 "Alas, sinful nation, people weighed down with iniquity, offspring of evildoers, sons who act corruptly! They have abandoned the Lord, they have despised the Holy One of Israel, they have turned away from Him." Isaiah 1 lays forth the accusations against Judah. Some scholars have dated vs. 4 - 9 to ca. 701 BC. These verses have been called The Woe Oracles. Israel become a sinful nation, "offspring of evildoers". This leads one to believe parents were not raising their children in righteousness and evil was passing from one generation to the next. Consequently the nation was losing its moral compass, its sense of decency and morality. We can draw a parallel to this in our modern day. God & Christianity are under attack, while acts of depravity are being glorified. Children are being raised outside of having any type of moral compass; and we see depraved act after depraved act - school shootings, babies left in dumpsters or flushed down the toilet, kids suing parents, teen pregnancies, abortion, etc, etc, etc. There is an overwhelming sense that God is absent. Isaiah says the people are "weighed down" with their sin. Other versions use the term, "loaded", or "burdened". Jesus addressed this state in Matthew 11:28. Though Scripture does not indicate outright what Israel turned to after they "turned away" from God, previous passages and history indicate it was likely after foreign gods and idols - which included such practices as sexual impurity via religious prostitution, unholy sacrifices and worship on the idolatrous high places outside of Jerusalem. Such was predicted by God, however, in Deuteronomy 31:20. "For when I bring them into the land of milk and honey, which I swore to their fathers, and they have eaten and are satisified and become prosperous, then they will turn to other gods and serve them, and spurn Me and break My covenant." Nothing surprises God, as He predicted the events in Isaiah 1 hundreds of years prior during the time of Moses. YHWH reveals His displeasure in Dt. 32:18-21. "You neglected the Rock who begot you, and forgot the God who gave you birth...I will hide My face from them...They have provoked Me to anger with their idols..."
Fascinating! Under the reign of King Uzziah, which was at the beginning of the 8th century (50-100 years prior to the writing of this verse), Israel & Judah experienced a prosperous time of growth and wealth. Just as God had predicted, they fell away into idolatry. 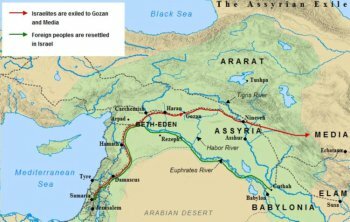 In 721 BC, God's wrath was felt by the Northern Kingdom of Israel as Assyria laid waste their land and exiled tens of thousands of Israelites to the remote corners of the Assyrian Empire. Now, southern Judah was in spiritual rebellion, and the Assyrian war machine lay at their doorstep like a ravenous wolf waiting to pounce. Isaiah reminds the people of God's past promises, deliverances and judgements; and he urges them to trust only in God's deliverance. Yet if they persist in their sin, they too will end up like their northern brethren. Isaiah 1 continues with Judah's spiritual state in vs. 5-6. 5 "Where will you be stricken again, as you continue in your rebellion? The whole head is sick, and the whole heart is faint." 6 "From the sole of the foot even to the head there is nothing sound in it, only bruises, welts, and raw wounds, not pressed out or bandaged, nor softened with oil." Judah is an open wound - untreated and festering with rot and stink. The spiritual state of the people is completely rotten at the core, from the "whole head" to the "whole heart". Jeremiah uses this idiom in Jeremiah 8:18; and again it is used in Lamentations 1:22. The people would've picked up on the totality of their sickness/sin by the use of this common idiom. Throughout Scripture sin is related to sickness. One's physical health is often used as a metaphor for one's spiritual state, thus Israel's broken and bruised body is a metaphor for their broken and bruised spiritual state of being. Here are some other examples from Scripture. "Who pardons all your iniquities? Who heals all your disease?" "When Ephraim saw his sickness, and Judah his wound, then Ephraim went to Assyria and sent to King Jareb. But he is unable to heal you, or to cure you of your wound." 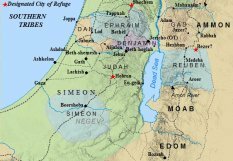 Ephraim is often used to represent the Northern Ten Tribes of Israel, while Judah is used to represent the southern tribes which formed the kingdom of Judah. Ephraim, or the north, failed to turn from their sickness and was sent into exile in Assyria where their sickness continued. Hosea warns Judah of a similar fate. In antiquity physical maladies or deformities were often blamed on one's sins, or the sins of one's parents. The deformity or malady was seen as a punishment from God, thus those people with physical issues were avoided and looked down upon. We see this in the New Testament Gospel of John. 2 "And His disciples asked Him, saying, 'Rabbi, who sinned, this man or his parents, that he should be born blind?' 3 Jesus answered, 'It was neither that this man sinned, nor his parents; but it was in order that the works of God might be displayed in him." Jesus then healed the blind man through the forgiveness of his sins - just like Isaiah promises God will heal Judah from her sins. However, Isaiah asks the question just how much longer they will continue in their rebellion. To continue much longer is to risk God's wrath. Ezekiel carried on Isaiah's metaphor of sickness and accused Israel's leaders of doing nothing to heal the people in Ezekiel 34:4 in a passage entitled Prophecy Against the Shepherds of Israel (NASB). "Those who are sickly you have not strengthened, the diseased you have not healed, the broken you have not bound up, the scattered you have not brought back, nor have you sought for the lost; but with force and severity you have dominated them." Who are the "Shepherds of Israel"? Their leaders - both politically and spiritually, which in ancient Israel were one and the same. This is a damning statement by Ezekiel; and one that readily applies to the crooked and perverse leaders of the nations today. All one has to do is look around the world to see a great number of people being dominated and oppressed by their respective leaders. Such has been the despicable state of humanity since Adam's first sin. 7 "Your land is desolate, your cities are burned with fire, your fields - strangers are devouring them in your presence; It is desolation, as overthrown by strangers." 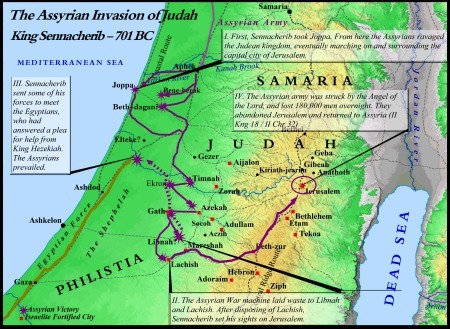 THE ASSYRIAN INVASION OF JUDAH UNDER SENNACHERIB IN 701 BC. THE ASSYRIANS RAVAGED THE LAND, EVENTUALLY MARCHING ON JERUSALEM. 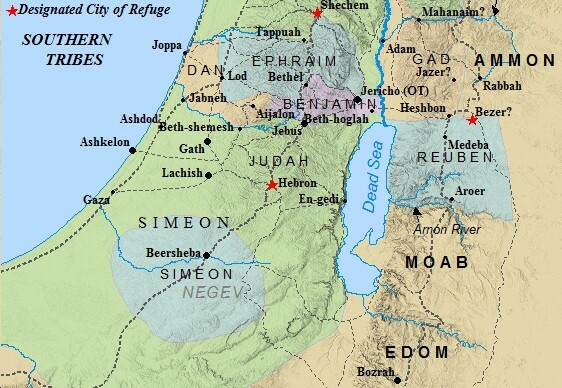 Isaiah 1 likely depicts the land during this invasion. Isaiah 1 continues to reveal Judah's immediate plight in v. 7. Verses 7-9 depicts the land of Judah experiencing the consequence of their sin, discussed in the previous 6 verses. Judah is under invasion in Isaiah 1:7. Many feel this verse depicts the state of affairs in Jerusalem around 701 BC - when Assyria laid waste multiple cities in Judah and encamped around Jerusalem to lay siege to the city. Indeed, the land was desolate with destruction, cities and fields burned to the ground. The massive Assyrian army under Sennacherib had taken over the fields and valleys in and around Jerusalem, and devoured the fruits of the earth from under the noses of Judaeans. Every morning people from Jerusalem would awake with the knowledge a foreign army was encamped right outside of their city walls, waiting for the breach to occur so they might destroy and murder the population. Indeed Jerusalem faced being "overthrown by strangers". The Bible records these events in real time in II Kings 18-19, and again here in Isaiah 1. What follows in the next verses is a shocking comparison of God's city to two of the most notorious cities the world has ever known. 8 And the daughter of Zion is left like a shelter in a vineyard, like a watchman's hut in a cucumber field, like a besieged city. 9 Unless the Lord of hosts had left us a few survivors, we would be like Sodom, we would be like Gomorrah. 10 Hear the word of the Lord, you rulers of Sodom; Give ear to instruction of our God, you people of Gomorrah. The situation described in verses 7-10 can certainly be applied to the state of Israel during the Assyrian invasion of 701 BC. Strangers were indeed devouring their fields within sight of the starving Israelites. However, this date should not be taken as certain as Isaiah 1 could also apply to other invasions, such as the Babylonian siege of Jerusalem in 586 BC, or other oppressions and invasions by Israel's enemies. Yet, given the context of Isaiah's ministry and the world-scene of the 8th century BC, it does seem likely he is referring to Sennacherib's invasion in 701 BC. The comparisons in verse 8 indicate helplessness. A shelter in a vineyard reaps no benefit of the produce, but only provided shelter for those working. 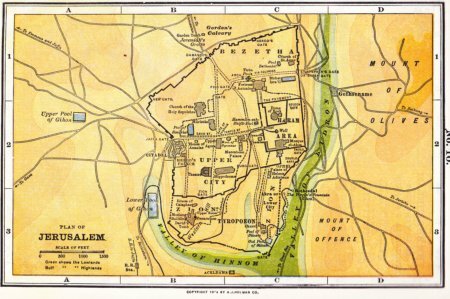 Likewise, Jerusalem reaps no benefit from their toil, but the land is now given over to strangers (the Assyrians) to devour and plunder in their presence. The opening verses of Isaiah 1 point to a dire time in Israel's history. The images presented in verses 7-10 echo the words of the Assyrian king Sennacherib in his annals from the Prism of Sennacherib. "As to Hezekiah, the Jew, he did not submit to my yoke, I laid siege to 46 of his strong cities, walled forts and to the countless small villages in their vicinity, and conquered them by means of well constructed stamped earth-ramps, and battering-rams brought near the walls combined with the attack by foot soldiers, using mines, breeches as well as sapper work. I drove out 200,150 people, young and old, male and female, horses, mules, donkeys, camels, big and small cattle beyond counting and considered them booty. Himself I made a prisoner in Jerusalem, his royal residence, like a bird in a cage..."
The prophet Isaiah witnessed all of this, and writes in Isaiah 1:9 unless the "Lord of hosts" had not expressed mercy, Jerusalem and the Israelites would have been destroyed utterly - like Sodom and Gomorrah. God's Crown Jewel, Zion, resembled more closely the wicked cities of Sodom and Gomorrah than the city of God. Forty-six cities destroyed, over 200,000 people exiled, and the local economy looted and destroyed. Isaiah surely read these words as he look down upon the burning campfires of the vast, fierce and plundering Assyrian army. Yet God spared His people, as v. 9 records He "left us a few survivors". It was not the behavior of the people that brought God's grace, but rather His character and desire which forgave Israel's sin and delivered them from Sennacherib. Otherwise they would have been destroyed as Sodom and Gomorrah was - complete and without mercy. A disturbing comparison is made in verse 10. The rulers of Israel are compared to those of Sodom; and the people to the people of Gomorrah. Does this indicate extreme sin in Israel? In v. 9 the comparison is between the state of the cities themselves. As Sodom and Gomorrah were destroyed completely, so will Jerusalem. This speaks of physical destruction. In Isaiah 1:10 the comparison is between the people's hearts and religious practices. This comparison is much scarier, and does indeed indicate sin amongst Israel's people. God had found guilt and sin amongst His people so extreme Isaiah levied this charge against them in verse 10. This speaks of spiritual destruction - hardening of the heart. In order to fully appreciate the sin of Israel it is important to read the accusation levied against the people of Sodom and Gomorrah in Genesis 13:13. "Now the men of Sodom were wicked exceedingly and sinners against the Lord." Further evidence against Sodom is given in Genesis 18:20. These words were spoken by God Himself as He visited Abraham with His two angels. 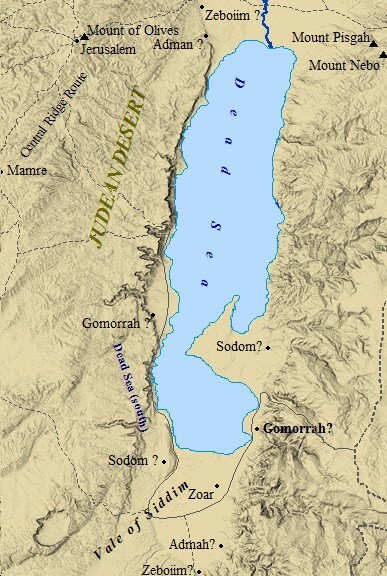 The NT sheds further light on the specifics of Sodom and Gomorrah's sin in Jude 1:7. Surely the priests and people of Israel were not guilty of these acts? Isaiah simply meant to imply Israel's heart as a nation was like the heart of Sodom, not that they were guilty of such perversion. God's holy people were above such actions. Yet, this proves untrue. Indeed they were guilty of such acts and perversion. The prophet Jeremiah levied these charges against Israel's leaders and people in Jeremiah 23:14. Jeremiah was in the century after Isaiah, during the Babylonian invasion of Jerusalem ca. 586 BC. Thus the people's hearts seem to have not changed from Isaiah's time to Jeremiah's. Isaiah saw the Assyrian invasion and exile - Jeremiah the Babylonian destruction of Jerusalem and exile. "What are your multiplied sacrifices to Me? says the Lord. I have had enough of burnt offerings of rams, and the fat of fed cattle. And I take no pleasure in the blood of bulls, lambs, or goats." Verse 11 begins the specific charges against Israel. Smith correctly points out it would seem one major difference between the people of Sodom and Jerusalem is that the people of Jerusalem are offering sacrifices to God. Nevertheless, it becomes clear God is wholly dissatisfied with them in Isaiah 1:11. Israel's sacrifices, meant to atone for sin and reconnect with God, had become meaningless, hollow, ritualistic with no true heart of worship. Their actions, according to Jeremiah and Isaiah, displayed a heart more in line with Sodom than Moses. J.A. Motyer calls these people "long on religion and short on morality". We see a similar charge against Israel by the prophet Samuel in I Samuel 15:22. "And Samuel said, 'Has the Lord as much delight in burnt offerings and sacrifices as in obeying the voice of the Lord? Behold, to obey is better than sacrifice." Samuel made these statements around 1100 BC. Isaiah made his ca. 750 - 700 BC. Jeremiah made his around 600ish BC. The same statement can be applied to today's church, AD 2014. The point is, this is a timeless charge against mankind. What is the state of our heart? Has the Lord as much delight in big buildings, large numbers and good music as in obeying the voice of the Lord? Isaiah makes the point God's people must always be aware of their motives and their heart. Why do we worship? In the case of ancient Israel, it was because that's what they were supposed to do - it had become ritual. Heed the words of the Lord through the prophet Hosea, in Hosea 6:6. "For I delight in loyalty rather than sacrifice, and in the knowledge of God rather than burnt offerings." It is interesting this verse highlights knowledge of God. True knowledge of God will undoubtedly create a sense of reverence and respect for who God is. To know God is to fear God. To fear God is to understand His compassion, yet be acutely aware of His might. God had this to say through the prophet Amos, speaking ca. 750 BC (his ministry only lasted a few days!) in Amos 5:21. "I hate, I reject your festivals, nor do I delight in your solemn assemblies." All should pay close attention to the words of Micah, Isaiah's contemporary, in Micah 6:8. Isaiah 1:12-14 indicate Israel's heart may not have been the only thing wrong, but their actual sacrifices may have even been idolatrous in nature! "12 When you come to appear before Me, who requires of you this trampling of My courts? 13 Bring your worthless offerings no longer, incense is an abomination to Me. New moon and sabbath, the calling of assemblies - I cannot endure iniquity and the solemn assembly. 14 I hate your new moon festivals and your appointed feasts, they have become a burden to Me. I am weary of bearing them." Simply put - God is tired of Israel's constant sin. He is "weary of bearing them". Everything they do in His name is empty, void of meaning. It is all ritualistic, and has been for quite some time. This is what God means when He accuses them of "trampling of My courts". The Jew's worship is, in fact, blasphemous and an affront to God. In fact, the language God uses - worthless, abomination, iniquity - are used in other passages in reference to idolatry and idolatrous worship. The NT addresses this form of religion or godliness in II Timothy 3. In verses 1-4 Timothy addresses the state of mankind "in the last days". Men will become "lovers of self, lovers of money...disobedient to parents, ungrateful, unholy...treacherous, reckless...". In v.5 Timothy sums up the state of mankind during this period; and his summary fits perfectly with the state of Israel in Isaiah 1 as well. "holding to a form of godliness, although they have denied its power. Avoid such men as these." Isaiah 1 makes it clear Israel has a form of religion. They still offer sacrifices, hold the festivals, observe the Sabbath and New Moons. They still worship at the Temple. Yet, their godliness is powerless - even perhaps idolatrous. King Manasseh rose to power towards the end of Isaiah's career. Jewish tradition states Manasseh murdered the prophet Isaiah. The words Isaiah uses in verses 12-14 which hint at idolatry are used again in regards to King Manasseh and the idolatrous religion he instituted as King of Judah. II Kings 21 records the wickedness of King Manasseh, which included child sacrifice. "He did evil in the sight of the Lord, according to the abominations of the nations whom the Lord dispossessed before the sons of Israel." "Because Manasseh king of Judah has done those abominations, having done wickedly more than all the Amorites did who were before him, and has also made Judah sin with his idols;"
Deuteronomy also addresses God's command to avoid at all costs idolatry. "You shall not bring an abomination into your house..."
"When you enter the land which the Lord your God gives you, you shall not learn to imitate the detestable things of those nations." Yet Israel did just that - and we are seeing the culmination of continual sin in Isaiah 1. Israel had fallen into a state of ritualistic worship, accompanied by idolatrous practices and forms of idolatry adopted from the other Canaanite nations surrounding them. Because of this, Israel found itself facing extermination and Isaiah's voice was their only salvation. To answer Isaiah's call was to repent of their abominations and wicked religion - and to turn wholeheartedly to YHWH, the God of their fathers. To refuse Isaiah's call was to face the harsh consequences of their sin - enslavement and exile. ISAIAH MINISTERED ca. 750 - 690 BC. HE WITNESSED THE FALL OF ISRAEL TO ASSYRIA IN 722 BC, AND THE ASSYRIAN SIEGE OF JERUSALEM IN 701 BC. IN THIS SENSE THE BIBLE IS A VERY ACCURATE HISTORICAL & RELIGIOUS TEXT. THE PROPHET JEREMIAH CARRIED THE TORCH - MINISTERING IN JERUSALEM AT THE FALL OF JUDAH TO BABYLON IN 586 BC. HISTORY HAS PROVEN THE BIBLE ACCURATE IN THE EVENTS DESCRIBED BY ISAIAH & JEREMIAH. "So when you spread out your hands in prayer, I will hide My eyes from you, yes, even though you multiply prayers, I will not listen. Your hands are covered with blood." This verse reiterates in a sense what is said in v. 12. God said when they simply appear before Him, before they even begin to worship, Israel is trampling upon His courts. In v. 15 God flat out tells them, "I will not listen". Spreading out one's hands and lifting the eyes to heaven was done when in prayer to God before the assembly, or at the Temple. It was the traditional Jewish posture of prayer, and was symbolic of pleading one's case before the Judge. We catch a glimpse of such an action with King Solomon in I Kings 8:22. Solomon "spread out his hands toward heaven", and then launched into a sermon for the people's benefit. Moses stretched out his hands to God in order to stop the plague of hail in Exodus 9:29. In John 11:41 Jesus raised His eyes to heaven and said; "Father I thank Thee that Thou heardest Me." In Lamentations 1:17 the city of Zion "stretches out her hands", but, "there is no one to comfort her". Tradition states Jeremiah was the author of Lamentations. If this is the case, then Lamentations likely is an eye-witness account of the destruction of Jerusalem by the Babylonians. Zion stretched out her hands, and Babylon answered the call. As Israel was conquered by Assyria because of her continual sin; so during the time of Jeremiah Judah was conquered by Babylon, in part due to the sin of Judah (during Isaiah's time) continuing without repentance for nearly 200 years up to Jeremiah's time. Much of what Jeremiah preached can also be found in Isaiah. As Assyria was the northern kingdom of Israel's punishment and consequence; so too was Babylon to the southern kingdom of Judah. The last line of v. 15 is the most significant, for it gives why God will not listen to His people and why He hides his eyes. Israel's "hands are covered with blood." The implication of this phrase in the Hebrew is an act of violent and premeditated murder of the innocent. In other words, Isaiah 1 reveals Jewish society had fallen into a state of violence with no justice. People were not being held accountable for their actions, and bloodshed increased without check. The people of Israel were under the yoke of sin and disobedience - and they had not repented. Their hearts were full of evil and their actions reflected such. Their leaders were not leading them in the way of righteousness. They were separated from God. Isaiah 59:3 sums up the state of their hearts and relationship with Yahweh. "For your hands are defiled with blood, and your fingers with iniquity; your lips have spoken falsehood, your tongue mutters wickedness." This is why God hides His eyes and turns a deaf ear to the prayers of Israel in Isaiah 1:15. The message from Isaiah to the people is clear - REPENT! "For I have no pleasure in the death of anyone who dies,' declares the Lord God, 'Therefore, repent and live." "16 Wash yourselves, make yourselves clean; remove the evil of your deeds from My sight. Cease to do evil. 17 Learn to do good; seek justice, reprove the ruthless; defend the orphan, plead for the widow." Isaiah addresses what must be done to heal Israel's relationship with God in these two verses; and seems to shift the focus a bit to social justice and ethics. In this way he addresses what a nation's government should be focusing on. Governments should promote justice, defend the innocent and law abiding against ruthless lawbreakers, defend those that cannot defend themselves, and plead for those that cannot plead for themselves. In Scripture the widow & orphan as a pair represented those people that were oppressed, disempowered, less able than others and on the fringe of society. Moses, in Exodus 22:22 says, "You shall not afflict any widow or orphan." In Psalm 68:5 God is called; "A father to the fatherless and a judge for the widows,". Multiple times in Scripture God is depicted as personally caring for orphans and widows (Dt. 10:18, 24:19; Ps. 10:14, 18; Jer. 49:11). How one treats people of this stratum of society is a reflection of one's heart. Israel's leaders had neglected them, thus neglecting the love God demands we have for one another. Widows in Jewish society were the lowest of the low. It was a patriarchal society, and women's roles and rights were very limited. A woman without a man was truly on her own, with nobody to defend her or stand up for her rights. Orphans, likewise, even in today's society have very little support and no voice. By promoting the well fare of these unfortunate souls, Isaiah is telling Israel's leaders what they need to do to please Yahweh and get the country back on the right path spiritually. Smith points out in the previous verses God is displeased with the worship practices and spirit of Israel. Verse 16 signals a shift to a discussion of social ethics which reveals the true nature of Israel's heart. Thus it would seem every facet of Israelite society was broken spiritually. 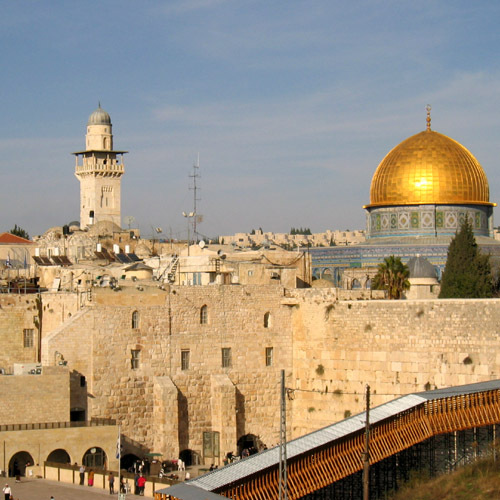 Nine things are listed that Israel must do in order to reconcile themselves with God. Isaiah tells Israel to "wash yourselves". Ceremonial cleansing was an integral part of Judaism. Washing oneself was symbolic of removing the sin from one's life - thus renewing the heart. God had given Israel detailed and thorough laws regarding cleanliness and washing. Isaiah is telling the people they need to ceremonially cleanse themselves, wash the sin and degradation from their lives. Isaiah 1 calls upon Israel to change the way they are living. The outward act of washing symbolized the internal cleaning of one's heart from sin. By removing the sin from one's heart, one begins a fundamental change in lifestyle. This is what Isaiah preached - this is what Israel needed; a fundamental change of lifestyle. Verse 18 is significant because it demonstrates how God works with mankind. We see here an invitation from God to His people. Isaiah points out in the previous verses that Israel as a nation has ignored and rejected God. Yet, here in v. 18 God Himself takes the initiative and reaches out to Israel in the form of an invitation to talk and reason. This should not be taken to mean Judah is allowed to justify its actions. Their guilt has already been determined and is not to be debated. God is offering them reconciliation by reaching out with this invitation. Smith points out this invitation opens the door "for resolution and restoration" for Israel. The Hebrew term translated as "reason" implies legal confrontation. Spiros Zodhiates states, "The prophet is saying, 'Let us debate our case in court.'" It is used 57 times in the Hebrew OT, and the basic meaning is to determine what is right. Oftentimes when Israel is accused of wrongdoing the language used indicates a courtroom situation in which the guilty party (Israel) must plead its case before the Judge (Yahweh). Micah 6:2 is a great example of such an instance. "Listen, you mountains, to the indictment of the Lord, and you enduring foundations of the earth, because the Lord has a case against His people; even with Israel He will dispute." Thus in Isaiah 1:18 Israel is called to stand in court before their Judge. Their guilt has already been declared. Their crimes have been named. Their punishment stands at the doorway (Assyria). They have but one opportunity to avoid their sentence, and that is to accept the forgiveness and restoration God is offering. The second half of Isaiah 1:18 has been interpreted a number of different ways. The controversy, if it is to be called such, lies in the seemingly unconditional promise of God to make Israel's sin "as white as snow". "...they (sins) may be as white as snow...they may be like wool." Some argue this interpretation better reflects the conditional nature of forgiveness between God and man. This relationship is spoken of numerous times throughout the OT. Read Leviticus 26:3-4,27-28. "If you walk in My statutes and keep My commandments so as to carry them out then I shall give you rains in their season, so that the land will yield its produce and the trees of the field will bear their fruit...Yet if in spite of this you do not obey Me, but act with hostility against Me, then I will act with wrathful hostility against you; and I, even I, will punish yoiu seven times for your sins." Despite Christ's offering of restoration and redemption, which parallels God's offering to Israel in Isaiah 1, "many will seek to enter and will not be able." (Lk. 13:24) The Northern Kingdom of Israel did not enter into God's mercy, and they were destroyed by the ruthless and merciless Assyrian army. Judah would be wise to learn from their fallen brethren. In Isaiah 1:19-20 Isaiah lays before Israel their two choices; and the consequence of each choice. "19 If you consent and obey, you will eat the best of the land; 20 but if you refuse and rebel, you will be devoured by the sword.' Truly, the mouth of the Lord has spoken." Israel's options reflect the options of mankind. We have but two choices - accept or reject God. These are the two choices of mankind. They were given to Israel by Moses nearly 3500 years ago in Deuteronomy 31:15. "See, I have set before you today life and prosperity, and death and adversity." The choice to be made is reflected by the life produced. The words of Jesus in Matthew 6:24 were equally adamant about man's choices. "No one can serve two masters; for either he will hate the one and love the other, or he will hold to one and despise the other. You cannot serve God and mammon." Thus in Isaiah 1:19 the prophet depicts an obedient Israel. This is a conditional statement; if an action is done, then a consequence will result (see 1:18 argument above). If Israel consents to God and obeys His commands, then they will prosper in their land, and eat the best of the land's produce. This should be read in conjunction with Isaiah 1:7. Read v. 7 below. "...Your fields - strangers are devouring them in your presence..."
As discussed above in relation to verse 7 this is likely depicting the situation in Israel ca. 701 BC - when the Assyrian army encamped around Jerusalem and laid siege to the city. The food of the land was being consumed by the Assyrian army as Jerusalem was a city under siege. Disease and starvation were deadly by-products of a siege. Thus in verse 19 Isaiah promises the invaders will be driven from the land because Israel will again, "eat the best of the land". But this will only occur if Israel repents of its sin and turns to its God. This promise was nothing new to Israel, however. Moses promised such thousands of years before, as recorded in Deuteronomy 28:1. "Now it shall be, if you will diligently obey the Lord your God, being careful to do all His commandments which I command you today, the Lord your God will set you high above all the nations of the earth." God had not changed His mind regarding His people, nor had He forgot His covenant with Noah and Abraham. He had not forgot what He told Moses on Sinai. Isaiah repeated to Israel it was still the case for them as a nation, and the same holds true for us today. Verse 19 depicts the human choice to follow God by submitting to His will for our lives and attitudes. By doing such we will prosper. Isaiah 1:20, on the other hand, presents the second option for mankind/Israel. If they refuse God's invitation, and if they continue in their rebellion, then they "will be devoured by the sword". Taken into context, this would have struck a very real and imminent fear into every Israelite who heard Isaiah. The sword which would devour them was not a metaphorical sword, one which they could not see, brought by a distant ruler in a distant land. The sword Isaiah spoke of was right outside of the city gates - and fighting to break them down. This was(and is) a very real and imminent danger for Israel. Every morning they awoke to Assyrian(Palestinian) campfires(missiles) smoldering outside of their city. The blood of their Northern countrymen had soaked the very blades of the men outside their walls. These same men intended to devour them with the sword as well. Isaiah's threat was not an idle one - but an imminent one. Isaiah 1:20 depicts the willful choice of mankind to seek selfish desires and ambitions. This rebellion against God cannot and will not be tolerated. As God is mercy and compassion, to rebel is to seek death and destruction, which is sure to produce bloodshed. "How the faithful city has become a harlot, she who was full of justice! Righteousness once lodged in her, but now murderers." A reoccurring theme in Isaiah is the "city" and its usage as a symbol for either sinful & prideful man, or, the righteousness of Zion. Later chapters in Isaiah speak of the "city of chaos" (Is. 24:10); "the fortified city" (Is. 17:3); "the unassailable city" (Is. 26:5); and "the strong city" (Is. 26:1). These different cities metaphorically represent those that rebel against God, and those which choose to obey God. Sometimes they represent actual cities, sometimes the word is used symbolically. In Isaiah 1:21, the "faithful city" is Jerusalem, however, now she is a harlot full of murderers and unrighteousness. This section of chapter 1 begins with accusations against Jerusalem and then lists those accusations. In verse 21, they include Jerusalem has become full of injustice, which is what allows murderers to go free and live amongst the people. She is no longer a city of faithfulness, but harlotry. 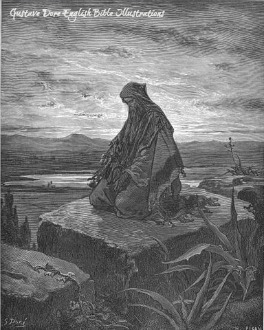 The term "harlot" in scripture usually indicates idolatry, and as Smith correctly points out; "The prophet begins by lamenting the sinful degeneration of Jerusalem". This degeneration stems from a worship of idols, as will be seen, and leaders who have lost touch with God and lead the people astray. Chapter one is just as much a warning for leaders, as it is for the individual. Isaiah speaks of righteousness once lodging within Jerusalem. This represents righteous leadership and guidance, thus a king focused on God rather than himself. Smith argues this is a reference to King Hezekiah and the religious reforms he instituted throughout Judah. Hezekiah brought forth God's favor on Jerusalem, thus the city was spared by the Angel of the Lord from King Sennacherib's Assyrian invasion. II Kings 18-20 relates in detail Hezekiah's reforms, near death experience, invasion by Assyria and his favor in God's eyes. Now, however, Jerusalem has come under the influence of evil, full of murderers, a city of harlotry and idolatry. Smith argues this represents the time of King Manasseh, one of the most evil and wicked kings in all of ancient Israel. For this reason Smith and others place the writing of Isaiah 1 at the end of the prophet's life during the reign of Manasseh, and later placed at the beginning of Isaiah because it is a proper introduction to the rest of the book. Isaiah 1 continues with the specifics of Jerusalem's sins in verses 22 and 23. 22 "Your silver has become dross, your drink diluted with water. 23 Your rulers are rebels, and companions of thieves; everyone loves a bribe, and chases after rewards. They do not defend the orphan, nor does the widow's plea come before them." These verses are aimed directly at Jerusalem and Judah's leaders of the time. Smith argues it is these accusations which were more prevalent during the reign of Manasseh than during the reign of any other king in Isaiah's lifetime. What does the prophet mean when he says; "Your silver has become dross?" Dross is defined as something that is considered worthless. This notion is in accord with drink becoming diluted - meaning it loses its flavor and strength. Both are associated with impurities. Silver becomes dross, or worthless, when it is diluted with less valuable metals, often base metals. This happened in antiquity when kings or governments would dilute their silver coins with less valuable metals. Thus the silver content is decreased, and the metal becomes dross, or worthless. Wine, likewise, was often diluted with water in order to create more wine for whatever the occasion. This, however, would reduce the quality, strength and flavor of the wine. Water is used today to dilute a number of substances. The essence of the accusations in Isaiah 1 is that Jerusalem has lost its righteousness by diluting their faith and religion with impurities such as idolatry, injustice, selfish ambition and love of money. A seventh sin, murder, is specifically mentioned as well in Isaiah1 :21. Jerusalem's sin was ripe. Isaiah condemns its rulers, which Smith points out as further evidence of the evil reign of Manasseh as being the prophet's subject in this chapter. Hosea spoke of ruler's acting as rebels as well, in Hosea 5:10. "The princes of Judah have become like those who move a boundary; On them I will pour out My wrath like water." This is a direct reference to one of the Mosaic Laws, handed down by God to Moses, who then relayed them to the people of Israel. This particular command is found in Deuteronomy 19:14. "You shall not move your neighbor's boundary mark, which the ancestors have set, in your inheritance which you shall inherit in the land that the Lord your God gives you to possess." "Cursed is he who moves his neighbor's boundary mark.' And all the people shall say, 'Amen.' "
In essence, the rulers were changing the laws as they saw fit. Remember, these verses in Isaiah 1 describe the king and his court, the princes, rulers, rich and elite and how they acted and governed the people. King Manasseh, again, presents a perfect example of such an evil ruler. His reign is recorded in some detail in II Kings 21. He was twelve years old when he came to power. II Kings 21:6 reveals shocking and startling information. "And he made his son pass through the fire, practiced witchcraft and used divination, and dealt with mediums and spiritists. He did much evil in the sight of the Lord provoking Him to anger." It is interesting to take note that three of the sins mentioned - thievery, bribes and rewards - deal ultimately with the love of money. This is nothing new. It brings to mind the words of Jesus from Matthew 6:24. No doubt the oppression of the orphans and widows also had something to do with gain of money and accumulation of wealth. Whereas we read in Isaiah 1 :21 Jerusalem used to be full of righteousness, her corruptness now was complete and total. Justice and righteousness had been replaced by oppression and greed. Lust was the law of the day, so much so rules and laws were changed simply for want. Jeremiah accuses the rulers of his time, saying they "do not defend the rights of the poor". They ignore the orphan "that they may prosper" (Jer. 5:28). This was a common problem in Israel, especially in the Northern Kingdom of Israel. Their demise was due, in large part, to the wickedness of their kings. Judah did possess righteous kings, like Hezekiah. However, Isaiah makes it plain such was not the case at the time of his writing this particular chapter. Ezekiel, from his exiled home of Babylon, wrote; "The alien they have oppressed in your midst; the fatherless and the widow they have wronged in you." However, the sin of Isaiah's time was especially grievous, for it was accompanied by child sacrifice and other abominable acts usually limited to the pagan Canaanite nations surrounding Israel. God would not stand for Jerusalem to continue in this state of wickedness. In the final seven verses of Isaiah 1, The Mighty One of Israel addresses His people. 24 "Therefore the Lord God of hosts, the Mighty One of Israel declares, 'Ah, I will be relieved of My adversaries, and avenge Myself on My foes. 25 I will also turn My hand against you, and will smelt away your dross as with lyre, and will remove your alloy. 26 Then I will restore your judges as at the first, and your counselors as at the beginning; After that you will be called the city of righteousness, a faithful city.' "
Verses 24-26 describe God's process of purifying Jerusalem. The emphasis on the last seven verses of Isaiah 1 is on God Himself and His actions. He alone is the sole focus now - not Jerusalem, Moab, sinful leaders, etc. Isaiah introduces this emphasis on God by using two different names to call upon God in Isaiah 1 verse 24. Isaiah first addresses God as "the Lord God of hosts". This appellation appears frequently throughout the Old Testament. This name signifies God is God of the heavenly realm - angels & demons alike. He is the supreme God of the heavenly realm, king of the heavenly court and all exist in His court as He wishes. We catch a fascinating glimpse of the Lord God of hosts holding court in Job 1:6; when "there came a day when the sons of God came to present themselves before the Lord". As if this is not interesting enough, we are also told "Satan also came among them". And thus began the trials and tribulations of Job. The second name Isaiah uses is the only time in the Bible Yahweh is referred to as such. Isaiah calls Him "the Mighty One of Israel". This name finds its roots in earlier names of God used by the Patriarchs. Indeed throughout the book of Genesis it quickly becomes evident God was a God of many names, each highlighting an aspect of His character. In Genesis 49:24 we find the origin of the term used by Isaiah. "But His bow remained firm, and his arms were agile, from the hands of the Mighty One of Jacob. From there is the Shepherd, the Stone of Israel." Jacob was the son of Isaac, the son of Abraham. Jacob was later renamed Israel, and had twelve sons we know of from Scripture. These twelve sons became the progenitors of the 12 Tribes of Israel. The story begins with Jacob in Genesis 28:10-22 when Jacob has a dream on his way back to Canaan after a twenty year exile. Jacob's vision includes an appearance from "the Lord, the God of your father Abraham and the God of Isaac". God declares He will give the land to Jacob's descendants, as He had already promised Abraham. The Lord God promises to be with Jacob, "and will keep you wherever you go...for I will not leave you until I have done what I have promised you". Later, in Genesis 31:13 God appears again to Jacob, saying "I am the God of Bethel". Jacob, of course, would've immediately recognized his experience in Bethel. In Genesis 31:53 God is called "the fear of his father Isaac". Later, in Genesis 32 - after Jacob's tense reunion with Esau proved a joyful one - he found himself wrestling with God, who renamed him Israel in Gen. 32:28. The next name given God subsequently is found in Genesis 33:20. Here, Jacob has undergone the trials of his sojourn in Mesopotamia, the dangerous journey home, a tricky reunion with Esau, and an all-night wrestling match with God which left him with a limp. Against all odds he has settled in Shechem, in the land of Canaan, his homeland. In Isaiah 1:20 Jacob, now known as Israel (Genesis 33:28), erects an altar and names it; El-Elohe-Israel. This translates in English as; God, the God of Israel. This was done to fulfill the vow Jacob/Israel had made to God in regards to a safe journey home. Jacob had said he would make God his God the God of his house and his family. He would have no other God but God Himself. Thus, when Jacob/Israel named Him, "God, the God of Israel", he simply meant his own personal God, the God of his house and family - for at the time he was only one man and not a nation. Later in Genesis 35:11 God reveals Himself to Israel as El-Shaddai; or, God (El) Almighty (Shaddai). In other passages, Isaiah refers to God as "the Mighty One of Jacob". Why is this important? To Jacob/Israel, this God was one of personal deliverance. He had brought Jacob safely back to his home. He had allowed for Esau's anger to subside over the years and successfully reunited the two brothers. He had blessed and prospered Jacob in possessions, making him very wealthy. Jacob, thus, acknowledged God as the God of Israel, or, the God of Jacob - the Mighty One of Jacob capable of delivering His servant ( and later His people). This would have resonated with Isaiah's audience. They likely would have recognized the significance of the term, Mighty One of Israel. For God had delivered Jacob in the face of great adversity - just as He would deliver them in their present darkness. In this respect Isaiah 1 is a message of hope and deliverance from the Assyrian army. God goes on to state how He will be relieved of His enemies and avenge Himself for the wrongs bestowed by His enemies. The assumption is God is referring to the Assyrians - which Isaiah 1:25 does suggest. However, God also makes evident Judah is not in the clear either, as He says in v. 25 "I will also turn my hand against you". God does not care whether Jew or Gentile - He seeks those that seek Him, period.
" 27 Zion will be redeemed with justice, and her repentant ones with righteousness. 28 But transgressors and sinners will be crushed together, and those who forsake the Lord shall come to an end." Building on Isaiah 1:26, in v. 27 Isaiah refers to Zion, or Jerusalem, as redeemed "with justice". The repentant ones of Isaiah's audience will be redeemed "with righteousness". Isaiah has presented his audience with two choices in Isaiah 1. Verse 27 depicts what will happen if one chooses to follow God. He will be redeemed, saved, restored by Yahweh. How do we enter into this state of redemption? The answer lies within the title used to describe the ones redeemed with righteousness - "repentant ones". To fully understand what this means it helps to look at the word or phrase in its original Hebrew. The phrase "repentant ones" has also been translated as "returnees". The LXX uses the term "captives" and thus reads; "For her captives shall be saved with judgement, and with mercy." Why the variance on this critical identification of the "repentant ones"? How are we to interpret this critical group of individuals who model the life God intends us to live? These people have been redeemed, yet their identity is given variously as; "repentant ones", "returnees" and "captives". The answer lies within the Hebrew term used here in Isaiah 1:27 - SHUWB (pronounced Shoob). It is literally translated as; to turn back, away, return, to turn around, to come back, to turn from, to cease. It is the 12th most used verb in all of the Hebrew OT (Zodhiates, p. 1782), used 1,060 times total. It is used to denote both physical action and figurative action. SHUWBAEL (pronounced sheb-oo-ale) is a derivative of Shuwb and translates as; captive of God, returned of God. In this light, "returnees" makes perfect sense, as these are the people of Judah who have returned to God. The repentant ones/returnees of Isaiah 1:27 are those in Israel that have turned away from the evil stench of King Manasseh's idolatrous religious system, and returned to the pleasant aroma of Yahweh as their God. This is the first choice Isaiah gives the people of Judah. Repent and thus turn away from worshiping the idols of pagan religion. Cease the evil sacrifices to Molech. Turn around from following Manasseh and evil. Return to Yahweh, the God of your fathers - for this alone will lead to redemption and restoration. This was the message of Jesus in the NT. "and saying, 'The time is fulfilled, and the kingdom of God is at hand; repent and believe in the gospel." This is the central message of the Bible - repent from our sins and evil and return to the way of the Lord. It is only by openly confessing our sins to the Lord that we are able to then turn away from them and turn back to God. This point Isaiah is teaching on in the OT would later become the very foundation of the NT - further proof the two books are of the same story. As verse 27 offers one choice, verse 28 presents Israel with their second choice. The parallelism in verses 27-28 is clearly evident. Whereas v. 27 depicts the righteous response, v. 28 depicts the negative choice. Notice ethnicity or national origin is not mentioned in verse 28 - simply "transgressors and sinners" are coupled together as one and the same. Isaiah stresses God does not care where you come from or who you are, but simply what choice you make. Notice that the ones who choose not to repent - the transgressors and sinners - are "crushed together". There is no redemption or deliverance for those who choose not to acknowledge God, in this case King Manasseh and the ruling elite of Jerusalem that followed his idolatry. Despite the fact that evil people seem to prosper, Isaiah assures the righteous of Israel that a day will come when they are crushed. We should not look upon our current situations or circumstances as irreversible - but rather look to God for He alone reverses the fortunes of man. Psalm 9:5 sheds more light on the ultimate outcome for these unfortunate souls. "Thou hast rebuked the nations; Thou hast destroyed the wicked; Thou hast blotted out their name forever and ever." Isaiah makes it clear that if Israel chooses not to repent and continues along their current path, then "those who forsake the Lord shall come to an end." Paul paints an even bleaker picture for these people in II Thessalonians 1:9. "And these will pay the penalty of eternal destruction, away from the presence of the Lord and from the glory of His power." The LXX says these souls "will be utterly consumed". This is a very different future from those found in Isaiah 1:27. Why are the people of v. 27 saved, while those of v. 28 perish? The answer is quite simple - because of their choice. We all have a choice to make - that is the essence of freewill. Isaiah lays out the two choices, presenting both with their consequences, and leaves it in the hands of the individual. The choice Isaiah's audience must make in Isaiah 1 is the same choice we must make some 2800 years later in 2014 - repent and be delivered, or continue in sin and die apart from God.
" 29 Surely, you will be ashamed of the oaks which you have desired, and you will be embarrassed at the gardens which you have chosen. 30 For you will be like an oak whose leaf fades away, or as a garden that has no water. 31 And the strong man will become tinder, his work also a spark. Thus they shall both burn together, and there will be none to quench them." Isaiah 1 :29-31 not only stress the mortality of mankind, but they also highlight the eternal consequence of rejecting God. Each choice the people make carries with it eternal consequences. Whereas above, in the first half of v. 27 we learn the "repentant ones" will be redeemed with righteousness, in v. 29 we learn those that choose the other path will be "ashamed" and "embarrassed". The NIV uses the words "ashamed" and "dsigraced". The Amplified Bible translates as "ashamed" and "blush with shame". The intent can be gleamed when the Hebrew word translated as "ashamed" in Isaiah 1 is analyzed. This word is "Buwsh", pronounced boosh. Its root occurs 155 times in the Hebrew Old Testament - 20 times in Isaiah alone. Of the 155 occurrences, 130 of them occur in Psalms or the Prophets. Jeremiah used the word 38 times. Buwsh often occurs in contexts of humiliation (Zodhiates, p. 1714). Buwsh has been variously translated as: to be ashamed, to feel ashamed, to be confounded, to be disappointed, to make ashamed, to keep waiting, to deceive, to disgrace. The root meaning of Buwsh is, 'to blush'. It denotes a feeling of public humiliation and disgrace. It is that state of confusion which arises out of a situation not turning out as expected. Zodhiates goes on to say buwsh conveys "the idea of shame at the hands of an utter defeat". In this respect Isaiah says those that reject God will be utterly humiliated at their decision. The oaks and gardens they have chosen are the idols and pagan practices of foreign nations, the detested high places of worship frequently denounced in the Old Testament. These gods will be shown to have no power - and people who put their trust in them will be embarrassed. These priests and people "inflame yourselves among the oaks". In other words, they get drunk on wine as they practice their pagan religion. Furthermore, Isaiah accuses them of "slaying the children in the ravines" (Isaiah 57:5) - child sacrifice to whatever foreign god they are worshiping. "A people who continually provoke Me to My face, offering sacrifices in gardens and burning incense on bricks;"
"For we are all become as one that is unclean...and we all do fade as a leaf..."
Verse 31 denounces the power of the enigmatic "strong man". A number of different interpretations exist as to the precise meaning of Isaiah here. However, suffice it to say, while its precise meaning is unclear it likely stands for the foreign religions and cults which worshiped in sacred groves, gardens and high places involving wooden poles. Gary Smith calls it the "great cultic oak tree" (Smith, p. 115). Isaiah denounced these cults, high places and the worshippers themselves with the harshest of language. Verse 31 emphasizes the weakness of these gods and stresses their ultimate fate - destruction by fire. Isaiah equates fire with the destruction of God's enemies in numerous places, and the idea is later picked up by Jesus Christ in the New Testament as well. In Isaiah 5:24 the prophet stresses those who "have rejected the law of the Lord of hosts" will be as stubble in fire, "and dry grass collapses into the flame". Isaiah uses a bit more graphic language to describe the same scenario in Isaiah 9:19. "By the fury of the Lord of hosts the land is burned up, and the people are like fuel for the fire; No man spares his brother." In Isaiah 26:11 we learn that "fire will devour Your enemies". John the Baptist used this same imagery of fire when describing the future ministry of Jesus in Matthew 3:12. Amazing! Perhaps knowingly under Divine Inspiration, or unknowingly but still under Divine Inspiration, John the Baptist seemlessly picks up on Isaiah's theme in Isaiah 1 some seven hundred plus years later! Christ has come to fulfill the mission Isaiah spoke of - to separate those that have accepted God from those that have rejected God. To redeem all of mankind, if the individual will make that choice. "Have you not even read this Scripture, 'The stone which the builders rejected, this became the chief corner stone,' "
Jesus quoted strategically from Psalm 118 - entitled in the NASB 'Thanksgiving for the Lord's Saving Goodness'. Jesus, like Isaiah, understood if we choose God then He will save and protect us from life's pitfalls - and give us the strength to overcome life's trials. Isaiah preached to the audience of his time with passion and zeal. The interesting part about Isaiah 1 is it was likely written at the first part of Isaiah's 40 year ministry. Thus, the audience of Isaiah 1 would not have listened to this message as the opening chapter of the book of Isaiah - but rather a fresh and new message aimed directly at them. So should the reader of today treat the message of Isaiah 1 as fresh and new. The timelessness of God's Word is clearly evident in the fact the Bible remains the number one selling book in the world today. Isaiah called for a brutal self examination, and then for the people to make a choice. True faithfulness to God requires one to "consent and obey" (Is. 1:19). Isaiah's message in Isaiah one is simple; "...Remove the evil of your deeds from My sight. Cease to do evil, learn to do good...". This message stretches from the opening verses of Genesis to the end of Revelation. It is a timeless message repeated by God's patriarchs and prophets over the course of millennia. It is as true today as it was thousands of years ago - and is worth repeating again.